I've written many times singing the praises of Thailand's street vendors. The food they serve is fantastic and the experience they provide is an amazing one. In our own neighborhood, I love paying a visit to a couple that cooks up chicken over a flaming barbecue. For very little money, you get a giant piece of deliciously smoky sweet chicken (that our family of four often shares), a side of white sticky rice and a spectacular peppery condiment to light your mouth on fire with. My only gripe? The amount of packaging used in this city is off the charts. 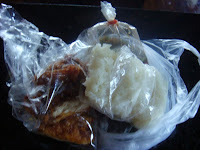 For the meal I just described, three plastic bags get encased in a fourth larger bag. And, from the volume of business being done, there's a lot of plastic ending up in the garbage at the end of the Bangkok lunch hour. However, looking at it with a slightly different lens, preparations begin with whole foods and compared to some other areas of the world there is probably less waste in the beginning of the meal's life. Everything is "home" cooked out on the streets. With the exception of the sweetened condensed milk used in the teas, coffees and some desserts here, I have yet to see canned or processed foods used by the vendors. Whole animals are used to create savory stocks, veggies bought from the local traveling green market are stacked high and hand made noodles and dumplings are rolled in front of your eyes. Even so, there's definitely room for improvement in the packaging of the final product. I'm sure I'll be seen as the crazy foreigner the next time I show up at my favorite vendor's stall carrying a reusable container for her to fill with her amazing chicken! One of the easiest meals you will ever make. Use the trick of garnishing it well and your friends will think they're dining at their favorite Thai restaurant! In a large deep saute pan, add 1 tablespoon of coconut milk. Heat and add the fresh noodles (if opting for dried, boil first to an al dente state). Add curry paste, beginning with a little and eventually tasting and adding more to suit your palette. Add remaining coconut milk and stir to coat. Add fish sauce and sugar. Taste and add more curry, fish sauce or sugar depending on your desired taste. Continue to stir until well combined and hot. Pour onto large serving platter and garnish by sprinkling the basil over the top. *If you can't find fresh egg noodles, fresh or dried spaghetti is a fine substitute.